Art.on.Wires Media Festival 2011, the Festival for Media Arts and Digital Culture, is being held May 25 - 29, 2011 at Betong/Chateu Neuf in Oslo, Norway. The Festival creates an annual forum for interdisciplinary exploration of future electronic arts and modern lifestyle. 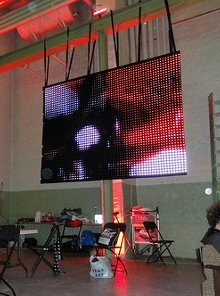 The Art.on.Wires Festival is an open laboratory, meeting point and hacker space for artists, designers, creative media professionals, multimedia researchers, engineers, and Do-it-Yourself enthusiasts. Under the title make : create : invent : recycle : explore, the Festival promotes education, collaboration, sharing and making of interactive and electronic art. There is direct dissemination of latest developments from Multimedia IT research to the public, as well as tutorials from leading artists and researchers, interactive installations and live performances. Attendees include professional artists, designers, architects, musicians, researchers, students and open-minded visitors joining a vivid and diverse group of experimenters to share, create, learn, play and be inspired by arts, science and technology. The Hitch Hikers Gui de To Circuit Bending and Junkbot – This workshop shows how to make simple beginner junk devices. Attendees will learn how to build and modify gadgets and how to turn them from plain nuisance to a tool of glitchy, noisy, speedy awesomeness. All one needs is "the willingness to make mistakes, repeatedly pop batteries in and out in order to reset things after crashing the processor, and a desire to make cool new stuff." Swarm Cube – The Swarm Cube is a kinetic light sculpture consisting of 64 dual color LEDs organized as a 4x4x4 pixel matrix. A single Swarm Cube can be controlled by a computer attached to its Mini-USB port. The cube also contains an embedded Arduino compatible microcontroller and a rechargeable battery which allow the cube to run independently of a host computer. Ableton Live – Learn how to use and create interactive cross-media environments for performances and installations. Get to know the basics of interactive systems, multimedia programming tools and foundations of dance and movement. The workshop is addressed to artists and engineers with different background and skill level who like to explore and dig into new fields. glMixer - A New Tool for Live Video Mixing – The author of GLMixer, a software for live video mixing, will present the philosophy and the features of this original tool designed for video artists and VJs. GLMixer is an open source project and can be downloaded freely on Google. GLMixer performs in real time the graphical blending of several movie clips (video mixing), a hybrid between image processing and video editing, but with a logic close to audio mixing. Typically, a set of video samples is loaded, and then one decides on the fly how much they should be visible and which effects to apply as the images are arranged in the screen. Shaders for Advanced Graphical Rendering in OpenFrameworks – Shaders are small programs that run on a graphic board (and not on the main processing unit) and allow for very efficient and powerful graphic programing. Attendees will learn how shaders can be used for various graphical renderings such as live image processing (posterization, contour detection, blur, colorization), mesh deformation (warping, waves, ripples), large data set visualization, or immersive animated environments. VVVV - An introduction into the Multipurpose Toolkit – vvvv is a versatile node-based programming interface suited for generative graphics, experimental animation, integration of sound and media, as well as full fledged media environments and interactive installations. The aim of the tutorial is to enable all participants to create their own audio reactive animation. Audio-visual live performances will be presented by Lars Graugaard, Jacob Korn, Jason Geistweidt, Nick Collins and Dubstep and Skweee, among others. The Art.on.Wires Festival is organized in conjunction with the NIME’2011 conference, a renowned international venue dedicated to scientific research on new technologies for musical expression and artistic performance with a broad international audience. For more information, go to www.art-on-wires.org. The 24th European Media Art Festival (EMAF) is being held April 27 - May 1, 2011 in Osnabrück, Germany, the place for experimental Media Art, witth the Exhibition, Planet M, on display through May 29. 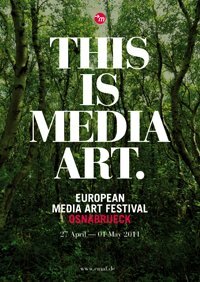 The EMAF in Osnabrück is one of the most important forums of international Media Art, an open laboratory for creative and artistic experiments that help shape media and aesthetics. The Festival is comprised of 170 short and feature-length films in 25 film programs, 29 art exhibit installations, 9 lectures, 8 workshops, 7 performances, two parties and a Media Art Garden at 13 different locations in Osnabrück. The New York Television Festival (NYTVF) just completed its sixth annual week of screening the best of independent "small screen" pilots, with a few network premieres thrown in to raise the celebrity visibility level. NYTVF had been known as the vagabond of local creative festivals, changing its venue every couple of years, but now appears to have found homes at the Tribeca Cinema and the SVA Theatre in Chelsea. Pilot screenings were held at the venerable Tribeca Cinema while panels, network premieres, special events and most receptions were held at the SVA Theatre. Although the limited party space at SVA (a/k/a the lobby) left much to be desired, particularly when compared to last year's airplane hangar-like space at New World Stages, NYTVF proved once again to be a successful, inspiring and fun event, with a number of informative panels plus one full day devoted to program development and another to the future of online video. In addition to the 46 pilots screened (all from the USA except for one from Canada and another from the UK), three televison pilots from Brazil were shown at this year's festival as part of the NYTVF PassPort Program. The festival opened with the red carpet premiere of the new ABC-TV cop series Detroit 1-8-7 starring Michael Imperioli (The Sopranos), who appeared at the post-screening Q&A session along with series executive producers David Zabel and Jason Richman. Eight members of the Running Wilde cast plus co-creator Mitch Hurwitz were on hand for the Q&A. Interestingly, Hurwitz revealed that the new show has been criticized in the media for not being enough like Arrested Development, but has also displeased some Fox executives for being too much like that classic sitcom of the early 2000s. On Saturday night at the SVA Theatre officials of the festival, including founder and executive director Terrence Gray, announced the winners of the Independent Pilot Competition, NYTVF People’s Choice Award, FOX-NYTVF Comedy Script Contest, and the IFC Out of the Box and MTV Animation awards. The festival joined with its corporate partners to announce the winners of the Fox-NYTVF Comedy Script Contest, offering a $25,000 prize and a development deal to Austen Earl and Luke Cunningham for Red Delicious. IFC’s Out of the Box award winners Matt Yeager and Jeff Skowron received a $25,000 development deal for their pilot Greg and Donny. The Independent Pilot Competition winners were selected from 42 independent television projects created by writers and producers from the USA, Canada and the UK. MTV presented its MTV Animation Award to 9 AM Meeting, which was accompanied by a $5,000 development deal, USA Network presented its Characters Welcome award for outstanding character creation to the title character in The Horrible, Terrible Misadventures of David Atkins, AETN honored Til Death Do Us Parts with the Best Nonscripted or Alternative Pilot award, and the third annual NYTVF People’s Choice Award, voted on by audience members, was presented to Illuminati Brothers. Awards were also presented for Best Comedy Pilot, Best Drama Pilot, Best Web Series Pilot, Best Actor, Best Actress, Best Non-scripted Host, Best Writing and Best Director. “We congratulate all the artists whose work was featured at the 2010 New York Television Festival and send our gratitude to our partners, sponsors and all the attendees who help support the independent television movement,” said executive director Gray. “The New York Television Festival enjoyed unprecedented success in 2010, in terms of submissions, attendance and industry recognition, and it will continue to help elevate writers and producers creating content for TV and digital platforms,” he said. The NYTVF is supported by sponsors including People’s Choice, MSN, and WME Entertainment. Official Network Sponsors for the 2010 festival included ABC, FOX, NBC, IFC and ION Television. The NYTVF works in conjunction with the Mayor’s Office of New York City. The NYTVF was founded in 2005 as the industry’s first recognized independent television festival, providing a platform to elevate the work of artists creating for the small screen. Held annually each fall in New York City, the birthplace of modern television, the festival unites artists, executives, industry figures, press and fans together in one forum to celebrate the medium and to help shape its future. Along with the Independent Pilot Competition, the festival features panel discussions, network premiere screenings, and other special events designed to honor television as an institution and as an art form.